Palli Karma-Sahayak Foundation (PKSF), Karmojibi Nari and Krishi Sromik Adhikar Manch (a platform of agricultural workers) jointly organised a discussion programme on the rights of agricultural workers at the auditorium of PKSF Bhaban on August 31, 2016. Dr. Qazi Kholiquzzaman Ahmad, Chairman, PKSF presided over the programme. Mr. Hasanul Haq Inu, Minister of Information of the People’s Republic of Bangladesh, was the Chief Guest of the programme. Mr. Md. Abdul Wadud MP, Member of the Standing Committee for the Ministry of Food, Ms. Shirin Akhter MP, Member of the Standing Committee for the Ministry of Labour and Employment, Dr. Pratima Paul Majumder, Chairman of Karmojibi Nari and Mr. Md. Abdul Karim, Managing Director, PKSF were present at the programme as special guests. The officials of PKSF, agricultural workers at the grassroot-level and other distinguished guests were also present. Among them, nine women agricultural workers who are now elected as Union council members and one agricultural labour leader were awarded recognition by the Chief Guest. Mr. Subal Sarkar, Secretary, Bhumihin Samity presented a concept paper on problems and possibilities of agricultural labourers. Mr. Rokeya Rafiq, Executive Director, Karmojibi Nari welcomed all. The programme started with a brief cultural performance. 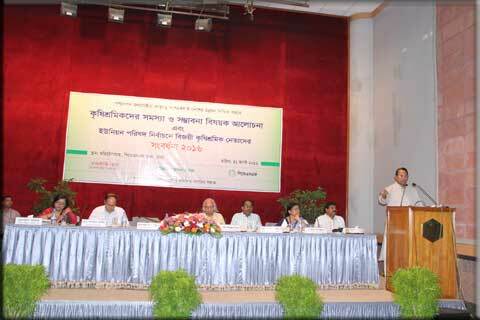 The Chief Guest Mr. Inu said that the Government is likely to initiate rationing system at the rural level. He urged that the employers must look after the welfare of the employees to remove inequality from the society. Dr. Qazi Kholiquzzaman Ahmad, Chairman, PKSF focused on the equal rights of all, particularly of the workers, as enshrined in the Constitution of Bangladesh. Dr. Ahmad said that the development process would smoothly go ahead with the recognition of everyone’s rights.